Inside: Had enough of toy clutter? 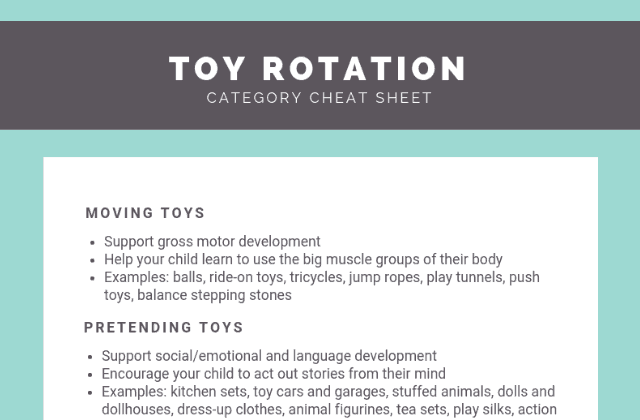 Here’s the ultimate step-by-step guide to starting a toy rotation that will make your kids happier + support healthy development. Every afternoon, my living room floor used to look like someone dumped a toy store into a blender and pressed “GO” with the top off. 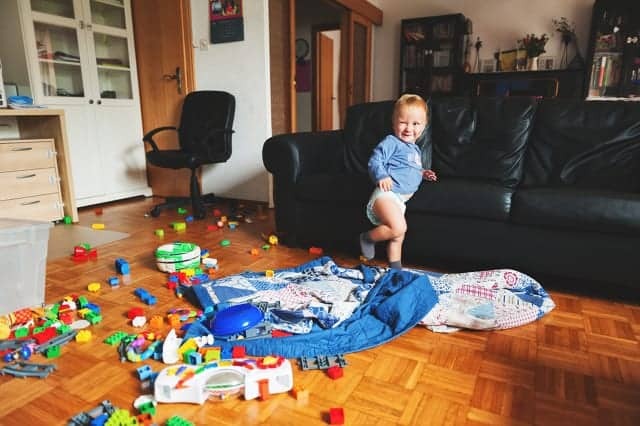 As I walked through my house and saw that the toy clutter had infiltrated not only the living room but also the dining room, the kids’ bedrooms, and every nook and cranny possible, my chest felt tight. Why can’t they put things away when they’re done playing? Why do they have to spread the mess around the whole house? And why can’t Mary Poppins and her clean-up magic be a real thing? 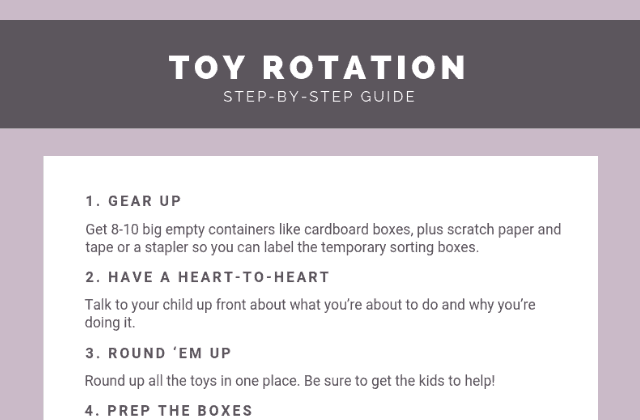 Bonus: As a bonus for joining my weekly newsletter, download a FREE printable toy rotation kit including a step-by-step guide, toy inventory log, and a toy organization cheat sheet. With a baby on my hip, I’d bend over and pick up a couple toys. Squatting while holding a 25-pound butterball turkey isn’t a pleasant sensation, so seeing the toy clutter brought on frustration. No kids in sight, but every single toy sure was. I tried to take a deep breath, but my nostrils stayed flared and I forgot to exhale. A couple heads peeked around the corner on the stair landing. They loped down the stairs, their heads hung. They knew what was coming because at one point, it was happening nearly every day. A full-fledged mom tantrum brought on by the sight of toys everywhere. 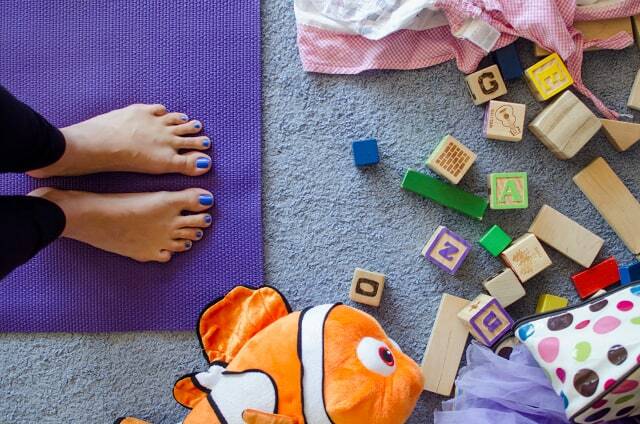 I wasn’t proud of how I lost my cool over my kids’ toy clutter. Every time, my toy-clutter-induced tantrums would create a fracture in my relationship with my kids. And if I didn’t stop what I was doing to mend the fracture and repair the relationship, the disconnection would lead to less cooperation from my kids and more power struggles the rest of the day. We couldn’t continue like that. I knew I needed to make a change. It had to be possible for my kids to learn to pick up their toys after they were done – without me nagging them or losing my temper. But everything I tried failed. And I didn’t realize until after my failures that I was missing the big picture. First, I tried approaching my kids with the patience of June Cleaver and asking them to clean up their mess. Then we learned Daniel Tiger’s clean-up song and sang it together. I even tackled our toy room organization, labeling all the containers with pictures of which toys go in them. All that helped a tiny bit, but the big problem remained: Toys ending up everywhere, me nagging the kids to clean it up, and me needing to supervise the whole process to make sure they didn’t get distracted or shove everything in a corner and call it done. So I researched what the experts say about how to deal with toy clutter, and I realized that I had completely missed the root of the problem. We didn’t need more toy room organization, and I didn’t need to grit my teeth and pretend to be June Cleaver or Daniel Tiger. The real problem? Too many toys. My reaction to toy clutter wasn’t unique. In fact, research shows that clutter can hurt your mental well-being, especially for women. Visual clutter can also increase your levels of cortisol, a stress hormone. When I stopped to think about it, that made perfect sense. And I realized that’s why my preschooler and toddler would just stand there, waiting for me to tell them what to do next. My kids’ not-yet-fully-developed brains were just as overwhelmed by the mess as mine was, if not more. When I asked them to clean up, their brains were stewing in a stress hormone bath. They didn’t know where to start. Even worse than that, I discovered that having too many toys was hurting my kids developmentally. Because when kids have too many toys, they feel overwhelmed. They end up jumping around from toy to toy without ever getting fully engrossed in playing with one specific thing. You might be thinking: So what? But it’s the experience of being engrossed in one toy that leads to real growth and development for your child. It’s kind of like if you started 10 different books all at once and took turns reading a couple pages from each one. You’d never get fully immersed in any of the books, and you’d struggle to pull any significant life lessons or new knowledge from the reading. And the clincher for me? I discovered that the average 10-year-old owns 238 toys but plays with just 12 on a daily basis. Still, it’s not like we had a bunch of junky old toys in our home that we just needed to get rid of. With four different kids at different developmental stages and with different tastes, preferences, and personalities, we had a healthy mix of toys. It was just too much to have it out all at once. So if a Great Toy Purge wasn’t the answer, how could we solve the problem of chronic toy clutter? Thankfully, I found the one magic solution that would tackle it all at once: toy rotation. If you haven’t heard of it before, toy rotation means periodically switching out the toys your child has available to play with so that only a few toys are out at any one time. Then you store the toys that aren’t currently in rotation out of the way, like in a closet, attic, or basement. When I first came across the idea of toy rotation, I was skeptical. I didn’t have time for another project. And I didn’t especially feel like dealing with the cries of protest when I told the kids I was putting 75 percent of their toys away. You can keep your toy rotation system simple and informal, or you can go for a more structured toy checkout system – kind of like a toy library at home. It’s completely up to you, so check out the steps below and do what resonates with you. Below, I’ve tried to cover all the possible gotchas, so it looks like a lot but you can actually get the whole toy rotation system set up in less than a couple hours – maybe even an hour if you hustle. Then after the initial setup, it’s super quick to rotate toys out. It probably takes me about 15 minutes every two or three weeks to rotate our toys. A small price to pay for an end to the overwhelming toy clutter on my living room floor! Quick tip: Decluttering expert (and my friend!) Sarah Mueller just opened the doors to her Declutter Your Home course – but only for a couple more days. In this online course you can do in your jammies, you get the powerful step-by-step process Sarah has used to help thousands break free from stressful clutter once and for all. Before you get knee-deep in toys while setting up your toy rotation system, you’ll be thankful to have already gathered a few helpful supplies. I skipped this step the first time, so I found myself with my toy rotation system all ready to go…but with no way to keep it organized. So I had to interrupt my progress and go on a scavenger hunt for supplies. Along with the containers, grab a stack of scratch paper and tape or a stapler so you can label the containers when the time comes in a later step. These won’t necessarily be the final containers for your toy rotation system, but they’ll be good enough until you figure out what you actually need later on. Note: If you’re the type of person who likes to plan ahead, skip ahead to step 6 for what you’ll need for your final toy rotation containers, then come back here to get back on track. If your child is older than a toddler, you’ll likely want to talk to them up front about what you’re about to do and why you’re doing it. I made the mistake of skipping this step the first time I started toy rotation. Someone had suggested that I should just hide all the toys while my kids were sleeping, leave a few out, and they would be none the wiser. Uh…wrong. Kids aren’t dummies, and I should have known better. My preschooler peppered me with questions every day afterwards: Where’s my horsey? Where’d my princess dress go? Mommy, I can’t find the Lincoln Logs! After I explained what I’d done, I felt silly for not including the kids from the start, so we went back to square one and went through the process together as a family. After you get everyone on the same page, you’ll need to round up all the toys in one place. The good news is this is the last time you’ll have to deal with all the toys in one big mess again. Woo! Pick one room to use as your Official Toy Rotation Headquarters. Then visit every other room in the house and gather up any toys you find to bring them to Headquarters. Go ahead and include the kids in this step because it’s actually pretty fun to root out all the toys hiding throughout the house. Like a toy scavenger hunt! Trash – This is where broken, unrepairable toys will go. Donate – This is for any toys your child has outgrown or doesn’t love. (Optional) Save for later – For example, if you’re planning to have another baby one day but don’t have any little ones in the baby stage right now, you’d put baby toys in this category. For the rest of your empty containers, you’ll be sorting toys based on how they support your child’s growth and development. Your goal will be to end up with several mini-collections of toys. You’ll want to make sure those mini-collections have a variety of toys to support different aspects of your child’s development. If that sounds confusing, don’t worry – I’ll step you through it! Moving toys – These toys help your child learn to use the big muscle groups of their body, also known as gross motor development. Examples: balls, ride-on toys, tricycles, jump ropes, play tunnels, push toys, balance stepping stones. 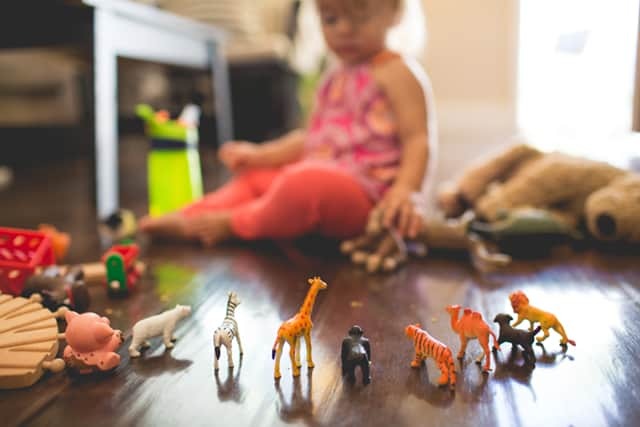 Pretending toys – Pretend play toys encourage both social/emotional and language development because they help your child act out stories from their mind. Examples: kitchen sets, toy cars and garages, stuffed animals, dolls and dollhouses, dress-up clothes, animal figurines, tea sets, play silks, action figures, puppets. Thinking toys – These toys support a child’s cognitive development by fostering things like problem-solving, cause-and-effect reasoning, math skills like counting and patterning, curiosity, and more. These types of toys also tend to teach hand-eye coordination and support fine motor development, which means the ability to make movements using the small muscles in your hands, wrists, and fingers. Examples: LEGOs, Magna-Tiles, bristle blocks, Lincoln Logs, puzzles, nesting cups, stacking blocks, pattern blocks, shape sorters, board games. Creating toys – The process of open-ended creating helps kids relax, focus, feel successful, and learn to express their emotions. When your child uses arts, crafts, and music toys, they’re primarily growing social/emotional and fine motor skills. Examples: art supplies, play dough, craft sticks, musical instruments, rain sticks. (Optional) Other toys – Sometimes you won’t be sure which category a toy fits into, and that’s okay. This doesn’t have to be perfect. Go easy on yourself and set up a category for other types of toys you’re not sure where to put. Examples: Nerf guns (moving toys or pretending toys? ), magic kit (pretending toys or thinking toys? ), noisy electronic toys (trash? ha!). * Thanks to Playful Learning and Green Child magazine for the category inspiration! The sight of your Official Toy Rotation Headquarters right now might make you hyperventilate, so it’s time to fix that. It’s up to you whether you include the kids in this step. Including them will likely make it go slower, but on the flip side, they’ll be a part of the process and start to learn the important life lesson of how to declutter toys and anything else. You’ll probably find that you want to go faster during this step because you’ll just want to be DONE by this point. But try to resist that urge so you can be intentional and deliberate. Because if you speed through this, you’ll still end up with too many toys, and toy rotation will just be a Band-Aid for a little while. Repeat this step one toy at a time until you have every single toy in a labeled box. Done? Kick the kids outside to play and lock the room so the kids can’t wreak havoc before your toy rotation system is up and running, then move onto the next step. Random – This is how we roll in our family. I rotate toys whenever the kids are having trouble entertaining themselves independently (i.e. lots of “I’m bored”s) or if the kids specifically ask for fresh toys. For the random approach, you’ll want a handful of permanent-ish boxes or plastic containers to hold your final toy collections (more on that in the next step). Some people group their toys into 3 containers, and some people have 10, so it’s completely up to you. You can use cardboard boxes, and that’s how we started out too. But cardboard boxes may not stand up well over time, and it’s hard to see what’s inside each one without opening it up. That’s why we switched to using these clear, stackable containers. Pro tip: Get stackable containers that will fit wherever you’ll be storing your toy collections when not in rotation – like a closet, attic, or basement. Weekly – Pick a day of the week to rotate toys, and get 4 containers to hold your toy collections. 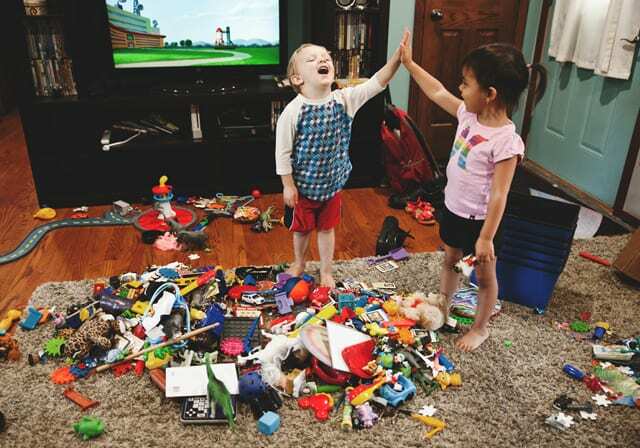 Daily – Some parents like to swap out toy collections every day. 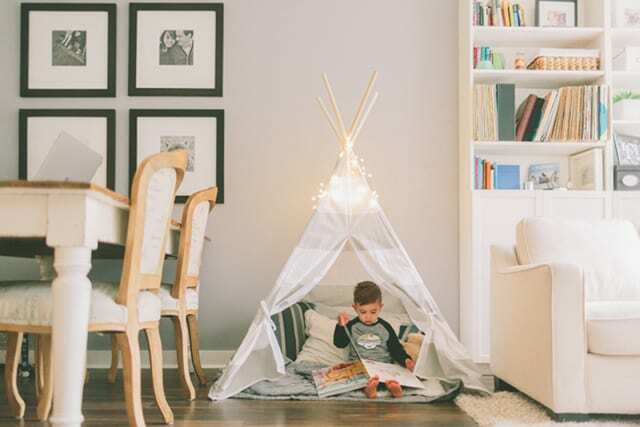 This typically works best for stay-at-home parents with younger kids because when you give the kids new toys every day, that lets you get away with other important stuff that needs to be done like laundry, dishes, and scrubbing your toddler’s “art” off the walls. If daily sounds like the right fit to you, you’ll want to get 7 containers – one for each day of the week. Not sure which way to go? Get 4 containers as a starting point, and you can always add or subtract later. Now that you have all the toys categorized and your empty containers ready to go, it’s time to match toys up for maximum fun and learning (and quiet time so you can play Candy Crush uninterrupted while your kids are busy). For example, one toy collection might include a jump rope (moving), Wonder Woman action figures and superhero dress-up clothes (pretending), LEGOs (thinking), and paper and crayons (creating). Side benefit: The kids will start using the toys in new and fresh ways. The jump rope may become Wonder Woman’s truth lasso, and the LEGOs may become the new Justice League headquarters. To start playing toy matchmaker, grab an empty container and pick one sorted toy from each category to add to your fresh new toy collection. Ideally, you’ll want to end up with 10-12 toys in each toy collection. If you have a lot of toys to start with, you might end up adding a couple toys from each category in each toy collection. If you find that you have more than about 10-12 toys in each collection, you may want to split some toys out for another collection. Your goal is to give your child a well-curated collection of a few toys so they can deepen their play experience. If your toy collection has too many toys, you’ll end up back where you started with overwhelmed kids and a mess of toy clutter. If your child freaks out at the idea of one of their favorite toys going bye-bye, no need to be a stickler for the rules and cause emotional trauma. If your kid has a favorite toy they play with every day, you can make an exception and leave that one out all the time. Your goal is to fix the toy overwhelm and help your child get the most out of a few toys, and making an exception or two won’t undermine that. You may find it helpful (and fun) to try to keep toys along the same theme together. For example, if you have a train set and a Thomas the Train puzzle, those would be great to pair up. That way, when you get the train set out, your child won’t beg for the train puzzle (or vice versa) and throw a wrench in your toy rotation system. When all toys have found their new homes, consider labeling the containers with what’s inside. Quick tip: If you got clear plastic containers, sometimes dry-erase markers will work on those. As a bonus for joining my weekly-ish newsletter, you can download a free printable toy inventory sheet at the end of this post (or with that link right there). 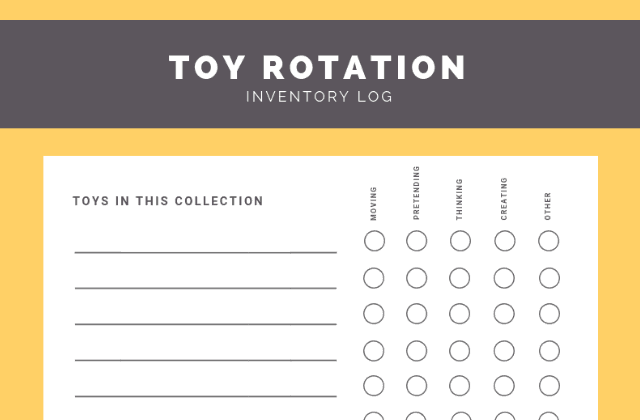 This inventory sheet is perfect for jotting down which toys are in each container so that when it comes time to rotate, you can round everything up quickly. Pick one of the toy collections to start with, then hide the rest of the containers. This is important because if you put the rest of the “not in rotation” containers somewhere your kids can see them, they’re going to bug you incessantly to get more toys out. You might hide the toy containers in a closet, garage, basement, attic, or even under the bed. Just make sure that the kids won’t be able to easily get into the toy collections because that will create a big jumbled mess of toys. Depending on the frequency you chose in step 6, you may want to set yourself a reminder on your phone or whatever calendar you use so you don’t forget to rotate the toys when the time comes. Or you can do what I do: I just rotate toys when the kids seem to be bored with the current set – or when they ask for different toys. Some folks recommended that I rotate toys while my kids were sleeping so they wouldn’t get upset at “losing” the old toys. I did this the first couple times, but I felt like I was trying to pull the wool over my kids’ eyes. That wasn’t a good fit for us. My toddler understands the idea of going on vacation, so I explained that the old toys were going on “vacation” and she would see them again soon. After that quick explanation, she had zero problems with toy rotation day. With that said, every kid is different, so go with your gut when it comes to handling the actual toy rotation. 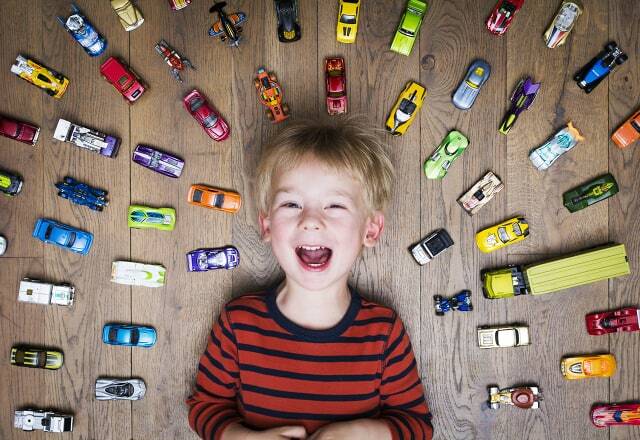 If you’re thinking of trying out toy rotation in your home, odds are you have a few questions about how to make it work for you and your kids. What counts as “one” toy? Is a LEGO set one toy? What’s the ideal number of toys to have in each toy rotation box? What if I have more than one child? What about “big” toys like dollhouses and play kitchens? What should I do with old toys my kids don’t play with anymore? What if my child asks for a specific toy that’s not in rotation? What about when we get an influx of new toys, like for Christmas and birthdays? What’s the best way to store the current collection of toys in rotation? How do I know if it’s time to rotate toys? What should I do with seasonal or holiday-specific toys? What if my toy rotation boxes don’t have many toys for a certain category? What counts as “one” toy? Is a LEGO set one toy? Yes! One toy could be a LEGO set, or it could be a set of animal figurines for pretend play, or it could be a couple coloring books with a box of crayons. If you happen to have a lot of one type of toy, like a gabazillion LEGO sets, you might want to divide them up a little so you have LEGOs in a couple different toy rotation boxes. Same goes for play food, dress-up clothes, and so on. What’s the ideal number of toys to have in each toy rotation box? 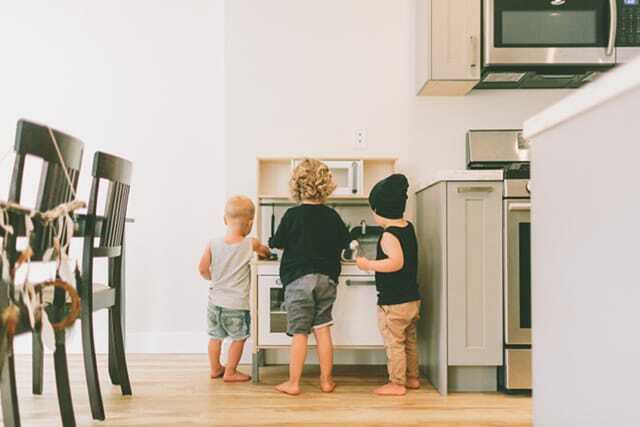 That will depend on a lot of factors: how many toys you’re starting with, how often you plan to rotate toys, whether your kids play with the same toys or are at wildly different stages, and so on. But in general, 10-12 toys in each toy rotation box seems to provide a good amount of variety without creeping into toy overwhelm territory. This isn’t about depriving our kids from enriching play experiences – just about helping them focus and avoid the overwhelm that undermines the best play experience. Here’s an interesting little tidbit about the guideline of 10-12 toys that may set your mind at ease: The average 10-year-old owns 238 toys but plays with just 12 on a daily basis. So even if you put more toys in each toy collection, your child may not be capable of playing with that many toys. If your kids are in vastly different developmental stages (like a tween and a toddler), you may want to include a few more toys in your toy rotation boxes to make sure you have a variety to meet everyone’s interests and needs. So instead of 10-12 toys in each toy collection, you might have 14-16. We have a 10-year-old, 5-year-old, 3-year-old, and infant, so the baby always gets a few of his own toys in each toy rotation box. But aside from that, the older kids play together well with the same toys. For example, they can spend an hour or more building with Magna-Tiles and using animal figurines for pretend play – It’s an aquarium! It’s a zoo! It’s a rescue ranch for fairy tale animals like the three little pigs! What about “big” toys like dollhouses and play kitchens? Shoving a dollhouse into an under-the-bed plastic container ain’t gonna happen. So don’t stress about hiding the big stuff like that. You can leave the big toys out all the time and rotate the toys that go with them. For example, you can put the miniature dolls for the dollhouse or the play food for the play kitchen in a toy rotation box. What’s fun is that your kids will get creative about what they use to play with those big toys. My kids have turned LEGO people into dolls for their dollhouse and turned Magna-Tiles, wooden blocks, and sock rolls into “food” for their play kitchen! What should I do with old toys my kids don’t play with anymore? If you’ve done your initial toy purge and now you’re wondering what to do with old toys, you’ll find a few options below. Just keep in mind that nobody wants broken toys, so if you can’t repair a toy, it needs to be recycled or disposed of. Donate old toys to a charity thrift store like Goodwill. Check with a local nonprofit about whether they accept toy donations. Children’s shelters and other nonprofits like the Boys and Girls Club will sometimes accept donated toys. But be sure to check first! It helps no one if you drop off a big batch of run-down old toys when the nonprofit can’t make use of them. Swap toys with another family in your neighborhood or with a friend who has kids around your kids’ ages. You get “new” toys for your kids, and your friend’s kids get “new” toys too. Sell a bunch of toys as a lot on Craigslist, or hold a garage sale to find new homes for them. What if my child asks for a specific toy that’s not in rotation? If the toy is an all-time favorite, think about whether it makes sense to leave it out all the time. You don’t want to make a ton of exceptions and undermine the whole point of toy rotation, but it’s fine to make an exception for a handful of your child’s most favorite toys. But if you get the feeling your child is just anxious to play with that toy now, you can do what feels right to you: swap the toy out with a similar toy in the current toy collection, swap the whole toy rotation box now, or tell your child to wait until the next day you’ll be rotating toys. That last one goes more smoothly if you can tell them the specific day and even show them on a calendar. What about when we get an influx of new toys, like for Christmas and birthdays? This is where the free printable toy inventory list will save you a ton of time. If you’ve listed the contents of each toy rotation box and marked the toy category, then it’s easy to see at a glance where you can squeeze in a new toy to round out a toy collection. But here’s another tradition many families enjoy: the month or so before holidays or birthdays, they go through their toy rotation boxes with their kids and do a mini-toy purge. To do this, it works best if you do it at the end of a toy rotation. Because that set of toys will be fresh on your kids’ minds, you can hold up each toy to the kids before you put it back in the box. Ask them if they’re still loving that toy or if they think it would be a better fit for another kid who may not have many toys. What’s the best way to store the current collection of toys in rotation? Kids (especially the younger ones) do best when they can see everything to choose from. When everything is “put away” and hidden, they may not realize what’s available to play with and then have trouble playing independently. We have a low bookshelf like this for storing the current toys in rotation so they’re easy for the kids to see. This also helps with toy clean-up because at the end of the day, the toys all have a home to return to. But if you don’t have a shelf like that, you can easily designate a table, bench, or just a corner of a room to achieve the same effect. How do I know if it’s time to rotate toys? Your child comes up to you more often to announce, “I’m bored” Your child starts playing with a toy but loses interest quickly Your child asks for television or other screen time more frequently Your child gets into things they know they’re not supposed to play with Your child seems clingy and is following you around all day – be sure to rule out sickness or emotional upset as the cause before blaming the current toy rotation box, though! With that said, if this all happens within a day or two of switching to a new toy rotation box, that could mean that particular collection of toys is either not robust enough to capture your child’s imagination or that your child is struggling to figure out how to play with some of the toys in that collection. For example, suppose you have a toy rotation box that contains a jump rope (moving), puppets (pretending), a puzzle (thinking), and a xylophone (creating). It could be that your child needs practice with the jump rope, would appreciate a story prompt for the puppets, is having trouble fitting the puzzle together, or hasn’t figured the xylophone out quite yet – or some combination of more than one issue. If you suspect that’s the case, set a timer for 10 minutes, put your phone away, and plop down to play with your child one-on-one. You’d be surprised how a quick parent-child play session can get your child “un-stuck” and back to playing independently! What should I do with seasonal or holiday-specific toys? Consider making a seasonal or holiday-specific toy rotation box or two, and then put those boxes in rotation when the time is right. 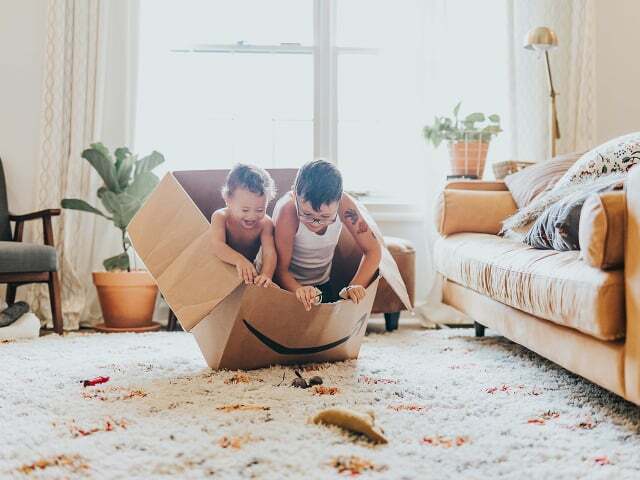 For example, you might have a summer toy rotation box that includes sandbox toys, squirt guns, sidewalk chalk, a backyard safari kit, and more. Or for a winter toy rotation box, you might include snowman-making supplies, snow shovels, or spare PVC pipe for making an indoor fort on frigid days. What if my toy rotation boxes don’t have many toys for a certain category? No worries! If your categories feel a little unbalanced, consider doing a toy swap with a neighbor or friend. This can be a permanent trade of toys or a temporary swap where you send the toys back to their original home after a period of time. You can also make a note to suggest toys in a certain category when grandparents and extended family ask for Christmas and birthday ideas. Again, this is where those free printable toy inventory sheets at the end of this post will be super useful. As another option, you can look for a local toy rental service. These services clean and sanitize every toy before sending it your way. Then when the novelty of the new toy wears off, you just send it back. Download the free kit. Join my weekly-ish newsletter and as a bonus, you’ll get the printable! Just click here to download and subscribe. Print the kit. Any paper will do the trick, but card stock would be ideal so everything holds up during the process of setting up your toy rotation system. Refer to the kit as you set up your toy rotation system, and fill out the inventory logs as you create your final, curated toy collections. Put the inventory logs inside the toy collection boxes. That way, when it’s time to round up that collection and put it away, you’ll have a list of everything to round up. Huge time-saver! What tips do you have for a successful toy rotation system? Share in a comment below! 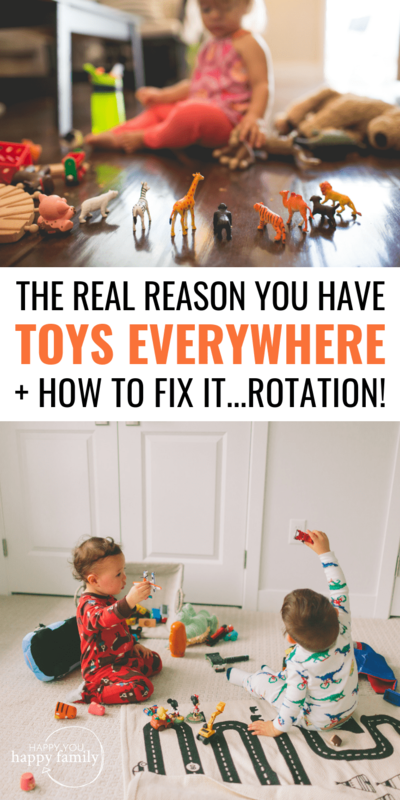 The post Why Your Kids Leave Toys Everywhere + How to Fix It With Toy Rotation appeared first on Happy You, Happy Family.